Photovolcanica has captured a tremendous pyroclastic flow that happened last week at Mount Sinabung, Sumatra: "A close-up of the lava lobe is shown including the collapse of the lobe front leading to a pyroclastic flow. Movement of the lobe prior to collapse is just about visible." That thing was really huge—it looks like the lava ran for more than a mile before stopping. 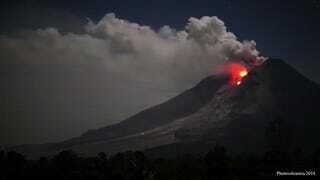 Read more about the Indonesian volcanos's activity over at Photovolcanica.